It's always a treat to be invited for eats, whether it be someone's house, a restaurant or a pot luck of some sort. What can I say, I love food (duh...). However, it is an outright honour to be included in events such as Hot Chefs, Cool Jazz and the Tourism Richmond Media Dine Around. So when I was contacted about the Signature Dish Dining Festival tasting tour, they didn't have to ask me twice! 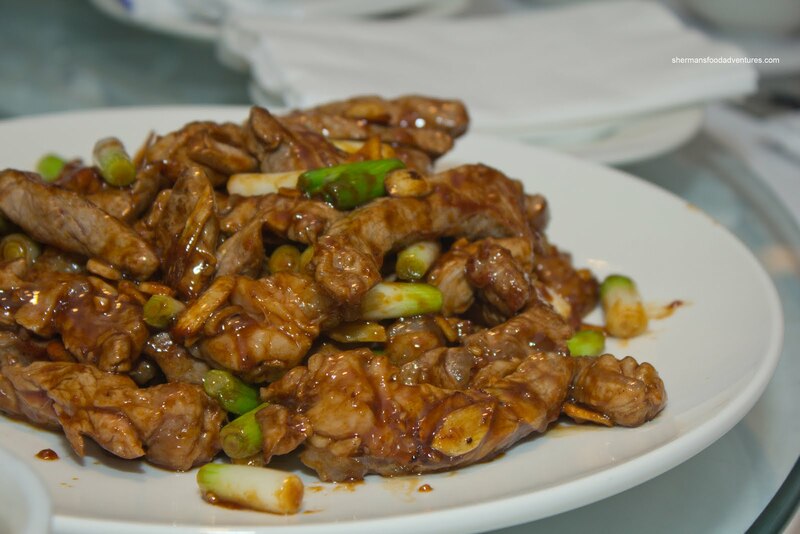 The whole premise of the Signature Dish Dining Festival is to help introduce the nominated dishes for the Chinese Restaurant Awards as well as exposure of other items that w ould not normally be on most people's radar (in particular, non-Chinese diners). 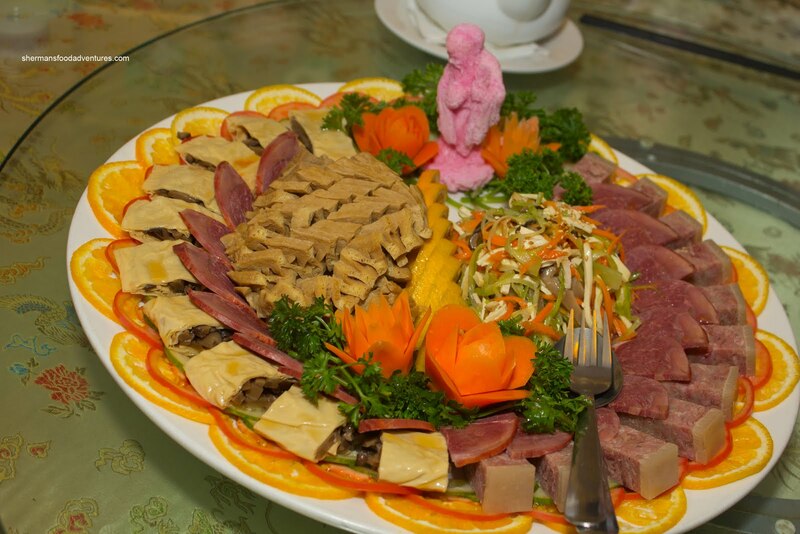 Think of it as Dine Out, Chinese-style with meals designed to accommodate parties of 4, 6 and 10 at price points of $100.00, $150.00 and $300.00 respectively. That is roughly between $25.00 - $30.00 per person. Considering the quality of ingredients in these set menus, these price points are pretty good deals. If you check out the menus, Alberta beef and pork, as well as B.C. 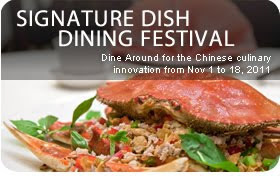 Dungeness crab are featured ingredients in all of the menus (as well as Amoy products as a title sponsor). The event runs from November 1st through to the 18th. Much like Dine Out, a reservation can be made via their website. There were 3 media tours that concentrated on the areas of Richmond, Vancouver and Burnaby. My schedule only allowed for Richmond and Burnaby. In hindsight, that was a good thing since the amount of food consumed in one night would be just plain nuts. Our Richmond tour started at Northern Delicacy in Aberdeen Centre. We began our meal with the Lanhua Tofu in Signature Cold Cut Platter consisting of jellied pork, mushrooms wrapped in bean curd sheets, Lanhua tofu, smoked beef shank and a julienned vegetable salad (mushroom, pressed tofu, celery and carrot). This was a carefully constructed plate (but of course!) and for me, the jellied pork really stood out. It had a wonderful texture and was seasoned nicely. Next was a truly sinful dish of Steamed Alberta Pork Belly with Amoy Black Vinegar Sauce on a bed of baby bak choy. Wow, the pork fat in this thing plain melted in my mouth. The only chewing required was for the small layer of moist meat underneath. The sauce was a tad salty and runny, yet exhibited plenty of depth. 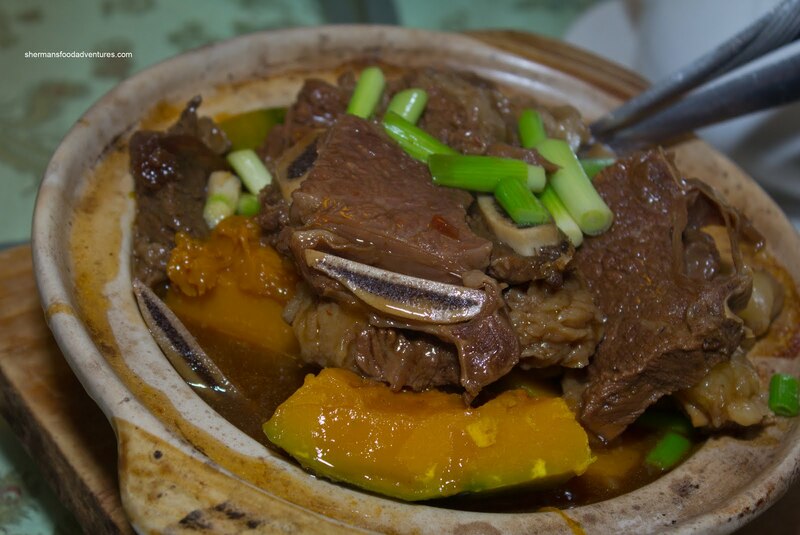 As if this wasn't enough food for the night (remember, this was only restaurant #1 of 4), the Szechuan Style Alberta Beef Short Ribs with Squash arrived next in a hot pot. I found the ribs to be perfect in texture which was the right combination of being tender while still retaining a slightly chewy texture. 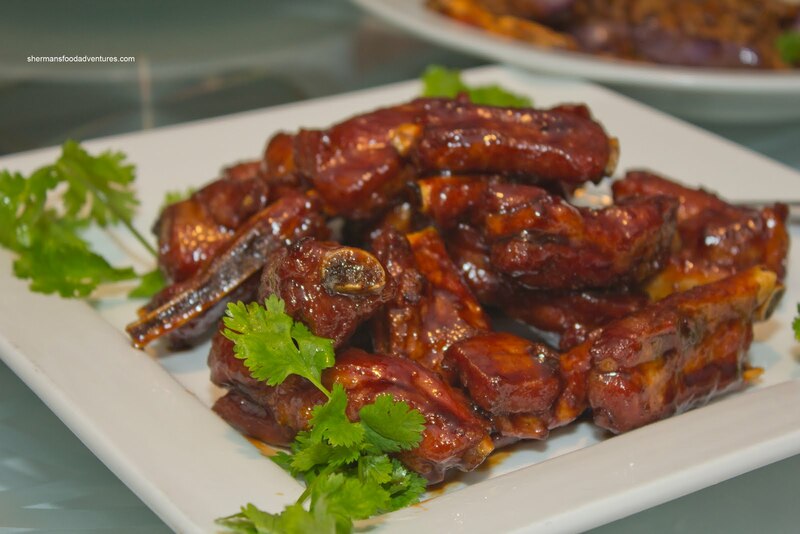 The ribs were meaty with very little in the way of fat, which in turn made them easy to chew. The sauce had a complex flavour (definite 5-spice hit) which was a bit spicy. 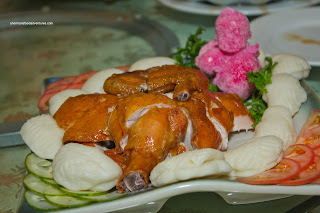 Lastly, we were presented with Smoked Chicken with Tea Leaves and Rose Pedals. By appearance alone, this looked like any other order of fried crispy chicken with some steamed mantou on the side. However, the juicy flesh revealed aromatics that was consistent with its namesake. So seemingly full after a complete meal at Northern Delicacy, we made our way over to Richmond Centre for our 2nd stop - Shi-Art Chinese Cuisine. Starting us off was the Deep-fried Shrimp Roll which was uniquely constructed and plated. At first, I incorrectly thought that the outside of the shrimp roll was mung bean thread. However, upon close inspection, it was merely a flour and water batter. The whole thing was friend perfectly. It was crisp, light and not oily. 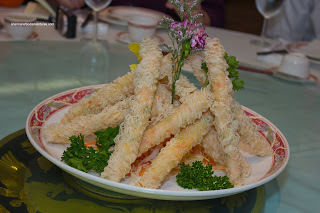 The sweet shrimp filling inside was complimented texturally by carrots and green onions. Next up was the Sauteed B.C. 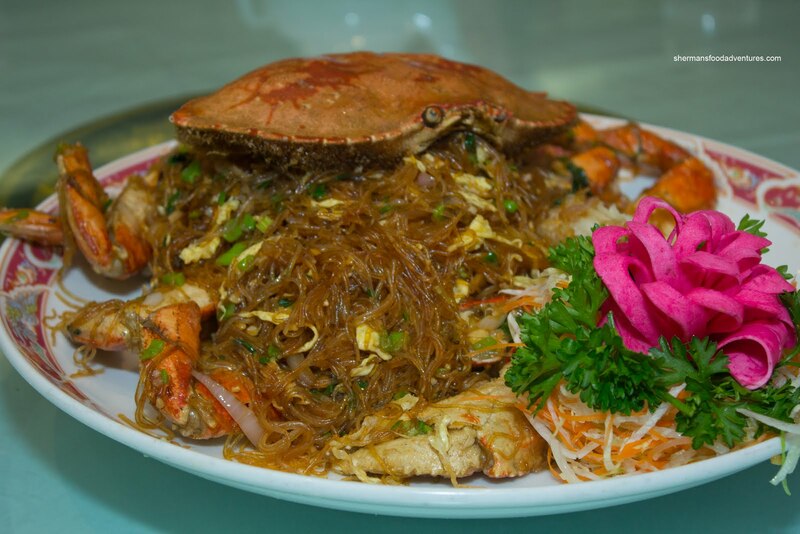 Dungeness Crab with Vermicelli. 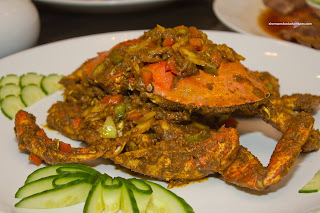 Naturally, they chose one of the plumpest, most meaty crabs to prepare for this dish. 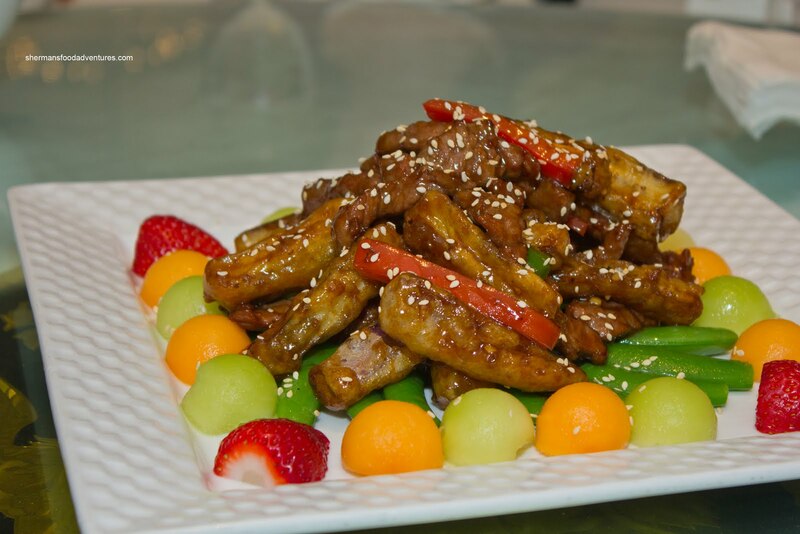 By now, it would be no surprise to anyone reading this post that all efforts were put into the dishes to impress. As mentioned, the crab was meaty, sweet and perfectly fried. The accompanying vermicelli was tossed with mushroom, shallots, egg and garlic. The resulting flavours were subtle, yet apparent. The vermicelli itself had the proper consistency of chewy while still soft enough to eat. 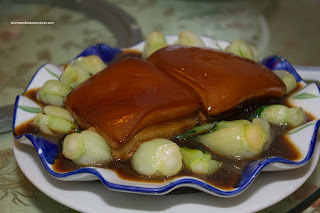 The Stir-fried Silver Cod with Green Onions and Amoy Light Soy Sauce confused some of us at first. We thought it might have been black cod, but in the end, it was silver cod which is very close in texture and taste. Hence, the flesh was buttery and soft. Despite being fried, the hot pot as a whole wasn't overly oily nor was it saucy either. This in turn allowed the pieces of fish to still retain some crispiness from the frying. The flavours were not overpowering with just enough soy, ginger and green onion. For the beef course, we had the Stir-Fried Alberta Beef Tenderloin with Wasabi & Eggplant. The veggies underneath (snap peas and red pepper) were vibrant and had a nice crunch. 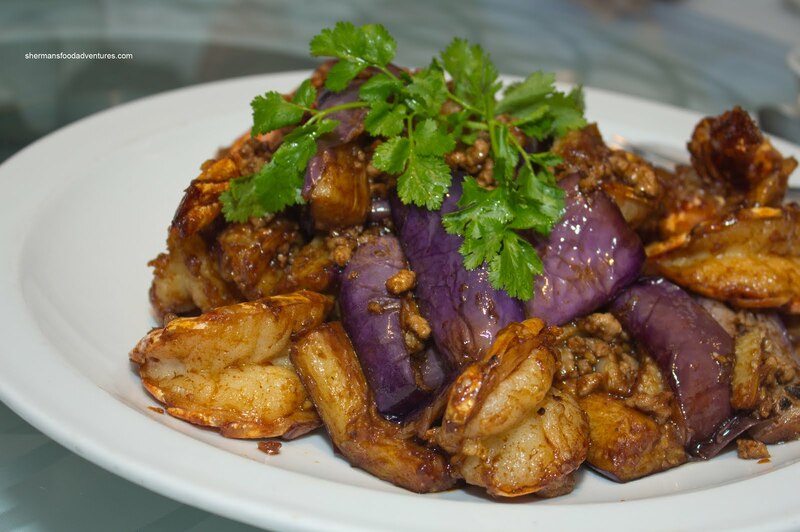 The eggplant was lightly battered which added a crispiness that contrasted the soft flesh. There was a touch of wasabi to add a unique taste to the flavour profile. As for the beef, it was super tender with just the right amount of seasoning. 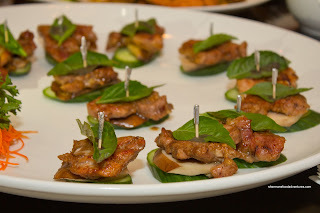 Our last dish at was the Pan-fried Diced Alberta Pork Cheek with Crispy Sliced Pork Belly. Since I am totally biased with anything cheek, I loved that part of the dish. 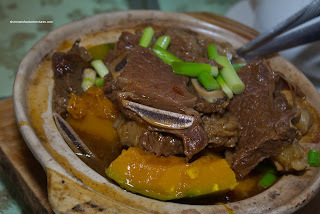 The pork cheek had the requisite rebound texture which was uniquely stir-fried with lemon and orange segments including the rind. The tart-bitter sweetness was an interesting flavour combined with shallots, straw mushrooms and chili flakes. I could've done without the fried pork belly though. Since they were thin slices, it ended up to be somewhat crispy, yet chewy. If it was thinner, it would've been a more crisp. And if it was thicker, there would be a meatiness to it. So this crazy food tour continued across the street to Bamboo Grove. With a name like that, many would assume that this would be a Dragon Inn-type of restaurant. Well, it was back in the day, but with new ownership, they just didn't change the name. The food is all authentic. And to start us off, they did so with an impressive dish - Stir-Fried Tiger Prawns with Minced Pork and Eggplant. These bad boys were enormous and would give any other prawn tail envy. These were succulent, sweet and exhibited that desired snap. The wok heat in this dish was very apparent with the absence of any excess moisture. Furthermore, the flavours were rich and the ground pork add the necessary depth. The eggplant was perfectly oil-blanched as well. 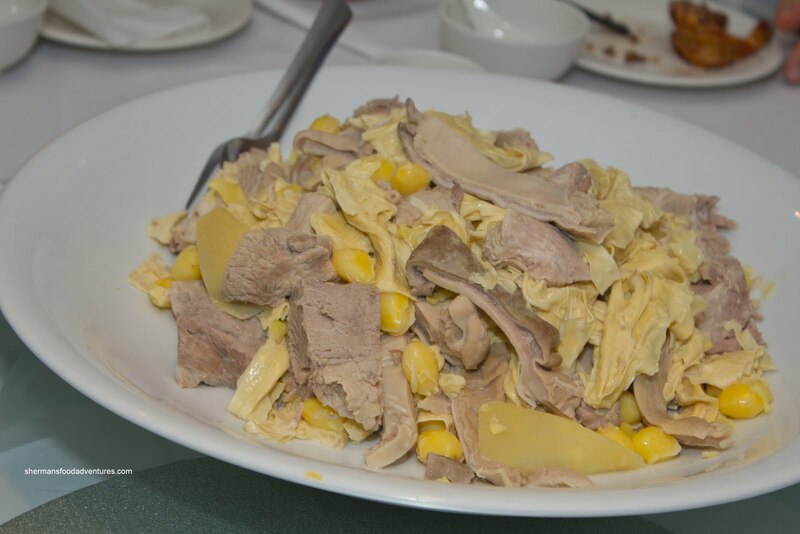 While we were enjoying the prawns, a huge plate of pig stomach, ginko nuts, pork and bean curd skin was presented before us. It was served with a soy dipping sauce on the side. Rather than being really a dish, this was the ingredients of the Award Winning Pork Stomach & Ginko Soup which was being heated table side on a portable gas burner. Therefore, the bowls of soup were scalding hot when served. This was the intention though since the subtle flavours were magnified. 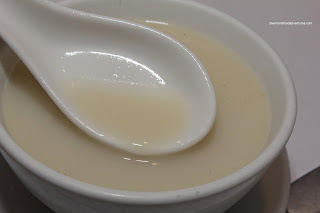 The soup had sweetness and depth without tasting gamy (a clear indication that the pork stomach was rinsed properly). The addition of white pepper was the ingredient that brought the whole soup together. Not only did it provide a nice bite, it also helped subdue any remnants of gaminess from the pork stomach. Once again, we had beef (of course) in the form of the Stir-fried Alberta Beef Rib Eye Steak with Green Onion and Garlic. Since they used the rib eye rather than the tenderloin, there was more natural meat flavour as well as meat texture. 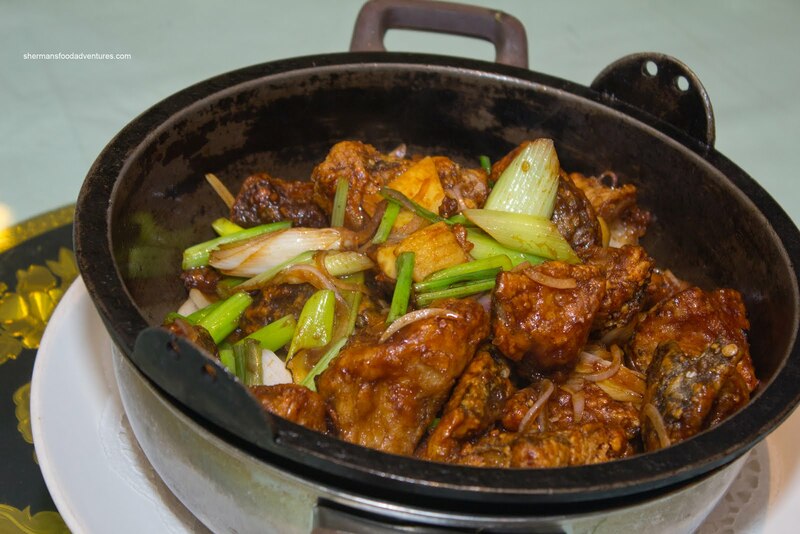 The starch-thickened sauce clung beautifully to each piece of meat and provided a subtle flavour without disturbing the meat. Moving along to a dish we had an interesting time trying to figure out. 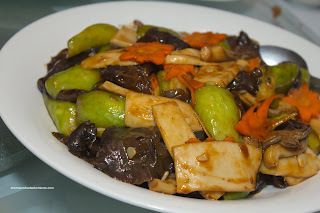 The Stir-fried Luffa, Wood Ear and Assorted Mushrooms was pretty straight forward except for the luffa squash. At first, I though it was either cucumber or chayote; but one bite and it was clear that it wasn't either of them. The squash was pretty nice. It was soft, yet not mushy. The combination of oyster, king and wood ear mushrooms provided a good mix of textures and flavours. This was a vegetarian dish that I would order for myself (or maybe I was going on meat overload at this point). On that note, the next dish was another protein - Alberta Pork Spare Ribs in Sweet Vinegar Sauce. 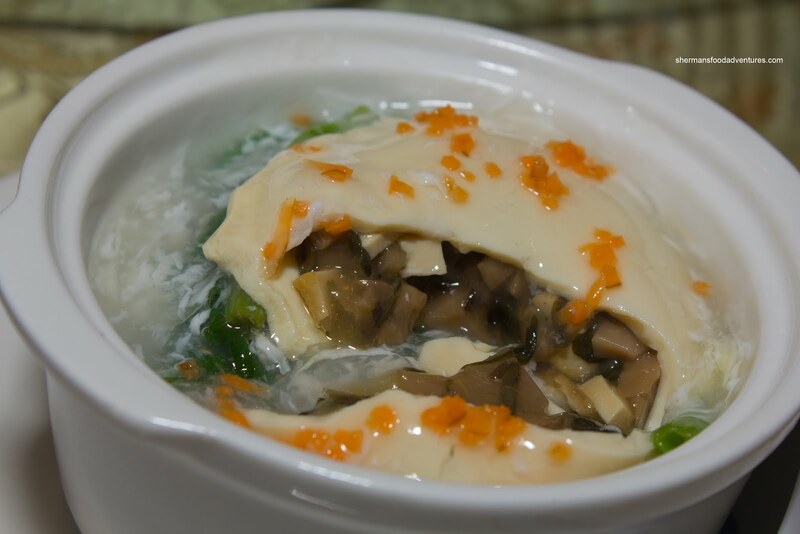 Okay, this my friends was the best dish, in my mind, that we had at Bamboo Grove. 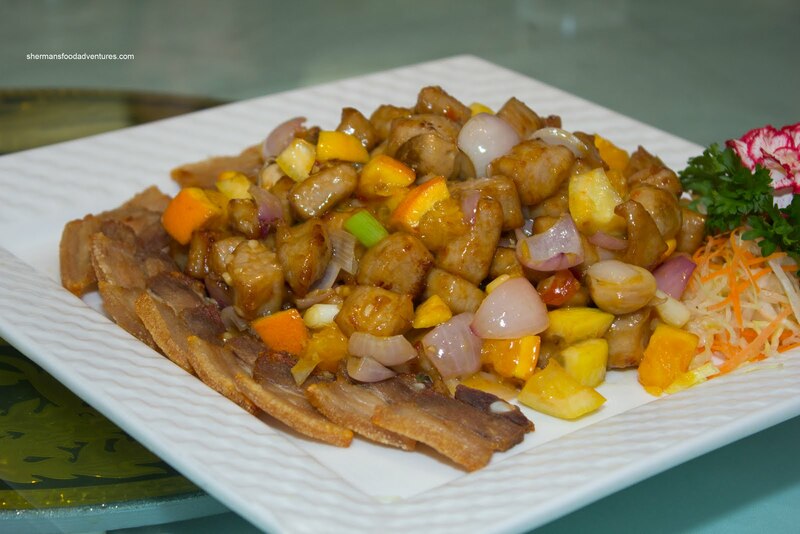 I mean, how could one not like deep-fried spareribs wok-tossed with a savoury sweet vinegar sauce? This could've been served at a BBQ joint and wouldn't have been out of place. The meat was on the chewier side, yet it was a desirable chewy (does that sound right?). I mean, it made my mouth happy. Er... Anyways, the texture combined with the crispy exterior coated with the tasty sauce made me want more. Pour me a pint and sit me down in front of a hockey game, I'll take a plate of these. OMFG. At this point, I could barely get up out of my seat. C'mon! 3 full meals consisting of many courses of both Alberta beef and pork. What now? How about one more restaurant at nearly 9:00pm??? Well, off to The Jade we went... And let's just get right into the food. 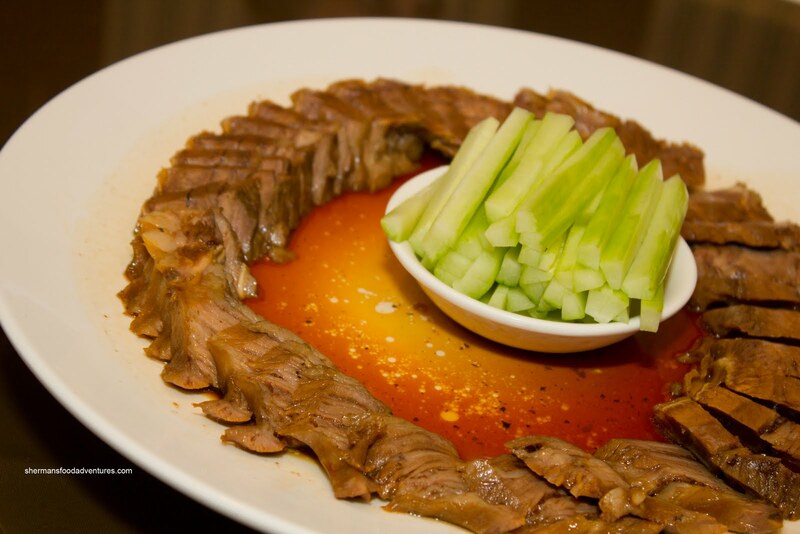 We were presented with the Alberta Beef Brisket Braised in Amoy Light Soy Sauce first. The brisket had a meaty texture with just enough fat to keep the meat moist. The sauce was not too salty nor too sweet. In fact, I found it to be a bit mild. Something as simple as cucumber sticks made all the difference in the world. It lightened up the meat dish with a cool crunch. At this point, I wouldn't have minded more veggies and my wish was granted with the Buddha’s Feast with Amoy Light Soya Sauce. 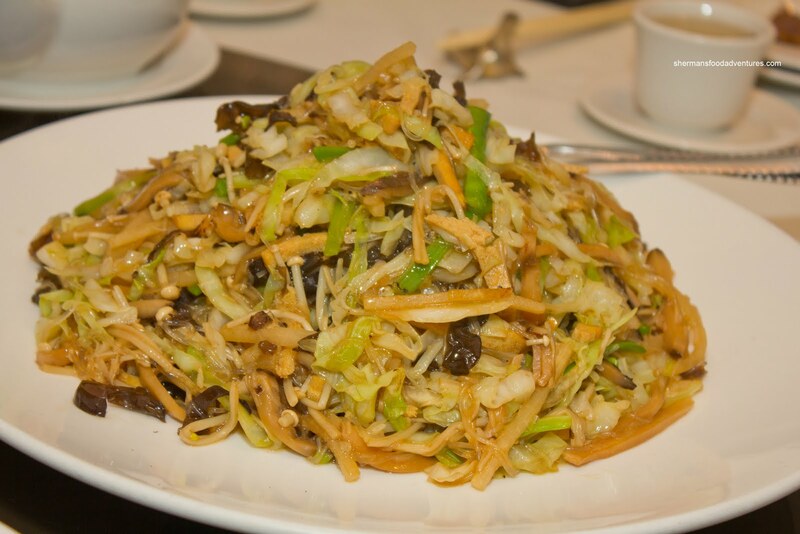 The dish was really large consisting of jicama, snow peas, cabbage, mushrooms, enoki, vermicelli and tofu. Lots of crunch from the jicama and snow peas as well as the strong mushroom flavour from the enoki. Not a spectacular dish by any stretch of the imagination, but welcomed at this point of total food coma. But the food coma would have to wait. Our second crab dish of the night arrived - Sautéed B.C. Dungeness Crab with Dry Curry. Although there was a good amount of curry flavour, it was far from spicy. 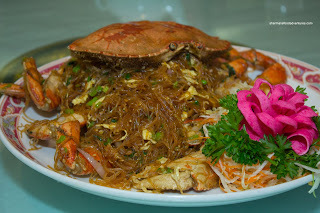 And honestly, if it were too spicy, the delicate crab would be overwhelmed anyways. On that note, I do realize some people prefer it spicier as well. If I had to do a direct comparison, the one from Luda is better. I found the one here a bit too mild and kinda wet. By now, the amount of food we consumed for one night was getting to be ridiculous. Thankfully, we reached our last dish with the Baked Sliced Alberta Pork Fillet with Herb & Mushrooms. This consisted of a piece of tenderized pork resting on a slice of portabello mushroom and cucumber topped with a fresh basil leaf. Despite being stuffed, I still found this enjoyable to eat. The pork was super tender and exhibited depth-of-flavour. The cucumber provided a fresh crunch while the portabello did its woodsy thing. The fresh basil on top was a nice touch. It added an herbiness at the tail end of the chewing. Definitely a unique dish not normally found in a Chinese restaurant. And this form of ludicrous eating would be repeated a few days later with the Burnaby tour! Aiya! Whatever the case, I was honoured to be part of this eating marathon and strongly encourage people to check out the Signature Dish Dining Festival.